We presented the Growth & Goals module to uOttawa’s Vice-Deans - Academic and had a great discussions. We asked them to help share the module with the professors in their Faculties and are already hearing back with follow-up requests for information and support. We have a number of ways to help professors tailor and integrate the module in their courses: http://www.flynnresearchgroup.com/module-and-resources. We presented the module at Trent University as part of the Distinguished Visiting Scholars series and had fantastic conversations with educators at Trent. We spent the trip home talking about our next steps in this project. We are so excited about how well it’s going and where it might go next! Are you participating in the longitudinal evaluation of the Growth and Goals Module? Emily, Kevin, and Alison presented the Growth & Goals module to the Health Sciences Curriculum Committee at uOttawa. Emily, Kevin, and Alison are presenting at the Global Online Learning Conference in Toronto. We have a new logo! Many thanks to Gisèle Richard, graphic designer extraordinaire, and the rest of the team at uOttawa’s Centre for Innovative Pedagogies and Digital Learning. Le Module d'objectifs et de croissance est maintenant disponible en français! Nous avons terminé cette étape grâce à nos membres étudiants — en particulier Emily — et au reste de l'équipe qui comprend des éducateurs, une graphiste, un expert en production, une conceptrice pédagogique et une traductrice professionnelle. Je vous remercie! Vous trouverez le module français sur la page Module et ressources. The Growth & Goals Module is now available in French! We completed this stage thanks to our student members —especially Emily—and the rest of team that includes educators, graphic designer, production expert, instructional designer, and a professional translator. Thank you! You'll find the French module on the Module and Resources page. Thanks to Professor Ng-A-Fook, Director of Teaching Education at uOttawa, for your helpful suggestions to improve our Growth & Goals module, including wellness, affective goals, and anticipating future learners' needs. The Growth & Goals Module is available for integrating in fall courses. Please don't hesitate to contact a member of our team if you have questions. The French version is coming soon! We have a NEW NAME for the module! You can find a demo version of the module here. 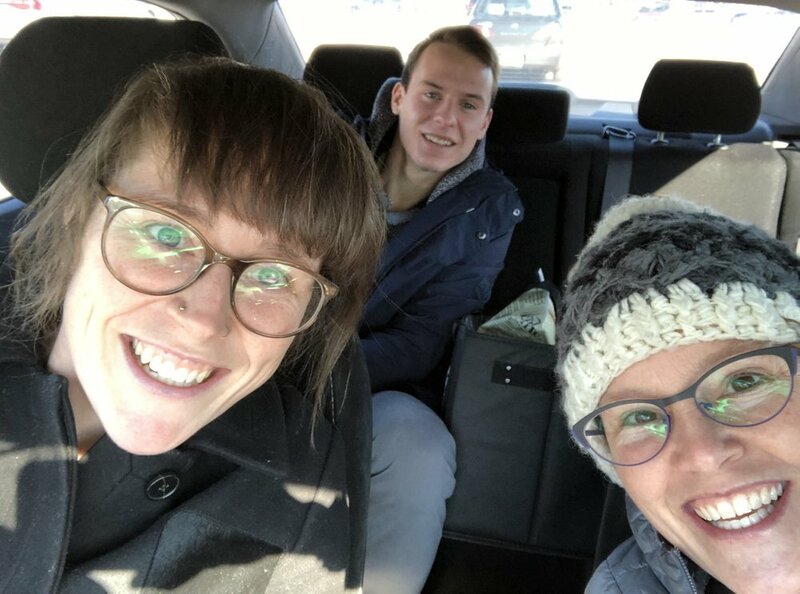 Emily, Kevin, and Alison headed to the Society for Teaching and Learning in Higher Education's Annual Conference to give a workshop on the module, called Hacking into your success. Alison met with Aline Germain-Rutherford, Associate Vice-President, Teaching and Learning, to discuss options for system-wide connections for our Hack Your Learning Module (Self-Regulated Learning and Growth Mindset). Alison met with Jean-Luc Daoust, Manager, Research, Evaluation and Performance in the Office of the Associate Vice-President, Strategic Enrollment Management Registrar, Liaison. We discussed our evaluation questions around student success and retention and planned our next steps. Alison presented the Growth & Goals Module to members of the uOttawa community with the Teaching and Learning Support Service. Following the presentation, participants were welcomed to stay for a workshop to begin exploring the module and preparing it for their fall classes. We had lots of excitement and positive feedback! A workshop at the Society for Teaching and Learning in Higher Education Annual Conference, June 20–22 in Sherbrooke, QC. More info to follow. Emily O'Connor, Elizabeth Campbell-Brown, Natalie Goto (via Zoom), Kevin Roy, Jovan Groen, Chris Boddy, Alison Flynn. Also attended: Matthew McCambley, Richard Pinet. Regrets: Jean-Luc D'Aoust, Brittany Love, Katherine Moreau. Thank you so much to all the participants in today's focus group! We learned a lot about the things you liked and didn't like about the module and we appreciate all your suggestions! We couldn't take your photo (to maintain your confidentiality), so here are today's facilitators instead! We've finished piloting the SRL / Growth Mindset module in a number of courses. Now we're analyzing the data from a concurrent evaluation of the module's effectiveness (we're using a Practical Participatory Evaluation Model). We'll be using our findings to improve the module. Next up with be translation and opening up the module for anyone to integrate in their course (any discipline, any level)—it's an Open Education Resource! Thank you to Alan Wright, Vice-Provost Teaching and Learning at the University of Windsor, who met with us today to share ideas and insight into our Self-Regulated Learning Module. We much appreciate his expertise and insights! Here's an update on the SRL project and tour of the module. I'd love to hear any and all of your comments and suggestions. I can also send you the module if you're interested in exploring it in depth, and/or using it in your own course. If you don't use the Brightspace learning management system, I can send it in alternate formats. Welcome to Kevin Roy, Undergraduate Research Opportunities Program scholarship recipient who has joined the SRL project! Kevin is working on the evaluation of the project. We are using a Practical Participatory Evaluation framework to understand what impacts the SRL project is having on learners, educators, and the wider university system. Here we go! The SRL module is ready and 6 profs are integrating it into their courses this fall! This module has come together thanks to a huge effort from students, Centre for eLearning, TLSS team members Elizabeth Campbell Brown (instructional designer), Emmanuel Cadet (web programmer and Coordinator Centre for e-Learning), Gisèle Richard (E-Learning Design and Marketing Support Officer). A number of students have piloted the module in its various forms as it was coming together, including Shobhitha Balasubramaniam and Tyler White. Thank you! Thank you to Olivia Faucher, Acting Manager of Access Services, for so many great suggestions to improve the Self-Regulated Learning module! Emily O'Connor has joined our team to help finish up the module. Emily is an engineer who is now also doing a degree in Science. Welcome! While we pilot the module, we will be conducting a program evaluation. Kaylee Eady (PhD, Education) and Katherine Moreau (Faculty of Education) helped us design the evaluation framework and Emily O'Connor is helping to implement and monitor this evaluation. Elizabeth Campbell Brown (Centre for eLearning, TLSS) and I met to start designing the SRL modules that will be launched in seven courses in September. We piloted V1 of the SRL workshop today. Thanks to all the Science students who came and worked with me on it and to the Science Students' Association for their support! This week, I met with Faculty of Education professor Katherine Moreau and graduate student Kaylee Eady to refine our research questions. I also met with Student Academic Success Service manager Jean-Luc D'Aoust to learn from his research and talk about ways SASS' existing resources could be integrated into this project. The Self-Regulated Learning project's Evaluation Team met for the first time together to establish evaluation questions and start thinking about associated indicators. Our Practical Participatory Evaluation team members include students, professors, members of the Teaching and Learning Support Service's Centre for University Teaching, Centre for e-Learning, Student Academic Support Service (absent today), and the Faculty of Science's Office of Undergraduate Programs (absent today). Thanks to Professor Katherine Moreau (CRECS, Faculty of Education) and Julia Halar for guiding us through this process! Faculty of Education and CRECS Professor Katherine Moreau is guiding us through the evaluation process, with help from Master's in Education student Julia Halar. Today I met with students from uOttawa Science Students' Association to get their advice and suggestions on developing a workshop and modules that help students develop self-regulated learning skills. Among the suggestions: make it optional (SRL is about learner choices, after all), offer incentives, demonstrate value (evidence, make events engaging, students want to leave with having accomplished something, with a product), and market in creative ways. They also suggested making an app and partnering with other campus organizations (meetings with SASS are coming up). Thank you SSA! My Chair in University Teaching project is rolling! The evaluation team is in place and we will be meeting mid-July with evaluation expert Katherine Moreau to guide the first steps in our Practical Participatory Evaluation. I'll be meeting with students from the Science Students' Association and manager of uOttawa's Student Academic Support Service to plan the workshop strategy, structure, and key components. More to follow!